Various reactions to the Uganda Elections around the world; worth taking a look at! If you think the Election Observer Monitoring teams had different views on the General Elections and Presidential Elections in Uganda. I have already dropped a few of the State Officials and Presidents who has congratulated President Museveni on his 5th Term. I will not repeat those as I put them on as to prove who is the friend of the man who is now unofficial president for the 7th term; first Russian, Engel (House Member of Committee of Foreign Affairs, U.S.A.), President Kiir of South Sudan and Ivan Ssemwanga. “Since the people of Uganda went to the polls yesterday, I have been deeply concerned by the government’s decision to block social media sites and by reports of pre-marked ballots and inflated tallies in some of the voting stations. These are affronts to a free and fair electoral process. I am likewise dismayed by reports that presidential candidate Kizza Besigye was arrested and that the home of another candidate, former Prime Minister Amama Mbabazi, was surrounded by security forces. I call upon both incumbent President Yoweri”. “Moscow hails the successful general elections in the friendly Uganda, which have proved broad national support for the government’s course towards stable political and socio-economic development” (…)”noted a generally open and peaceful nature of the election campaign and the voting process and observed no serious violations that could affect the results of the popular vote” (RBTH, 2016). ““Congratulations Big brother…..I’ll always take your advice seriously….You are a man of experience” (…)”Are you still in Mbarara (cattle camp)?” (Osobi, 2016). “South Africa based Ugandan socialite Ivan Ssemwanga was the happiest when Museveni won the Presidential elections and started partying straight away. The Rich Gang boss shared with us a photo while drowning in booze in celebration of President Museveni’s victory” (Bigeye, 2016). I think this here shows the difference reactions to it… As the American Official condemn the actions of Government, while the Russian friends of Uganda says it is a “Successful election” in their view so they have read the IGAD/EAC/COMESA statements and swallowed it whole as it fits the view of Moscow, Russia. While the friendship between South Sudan and Ugandan Presidents as they have helped each other now and then. Then you have a Ugandan in diaspora who is celebrating. That is enough for now. Peace. 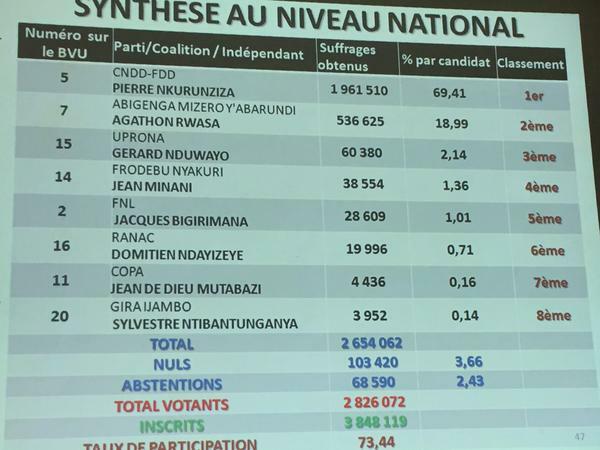 Today the results came from the Electoral Commission in Burundi wasn’t unexpected. We all knew that would happen. It’s not really much to say. We all expected it and there wasn’t really much news value in that. Other than the Government of Burundi will go into an uncertain future. With People of Burundi will not recognizing that Pierre Nkurunzia is again for the third time president of the Country. The president can use the High Court judgement, but that doesn’t stop the foreign pressure or local dissidence. The situation will be fragmented and sore wound after the violence want give more legitimacy to the President of Burundi. EAC had Election Observation Mission on the Election Day and has followed the election apparently. While the African Union and European Union suspended their missions and observers to it. So that they wanted to show that they didn’t’ want legitimacy to the actions of the president. There been oppressive actions towards the opposition in the country after the Coup d’état in the country. I think that the Preliminary Statement of the Election is worthy for everybody who follow Burundi show read it. Enjoy. Peace. In response to the invitation by the Independent National Electoral Commission of Burundi (CENI); the Standing Decision of the East African Community (EAC) Council of Ministers to observe elections in all EAC Partner States and the Decision of the 3rd EAC Emergency Summit on Burundi of 6 July 2015, the EAC deployed an Election Observation Mission (EOM) to the Republic of Burundi for the 21 July 2015 Presidential Election. The EAC EOM was led by Hon. Abubakar Zein, a Member of the East African Legislative Assembly (EALA) and comprised 25 members drawn from the EALA, National Electoral Management Bodies, National Human Rights Commissions, Ministries of EAC Affairs, and Civil Society Organizations from four EAC Partner States namely the Republic of Kenya, the Republic of Rwanda, the United Republic of Tanzania, and the Republic of Uganda. The Mission deployed seven teams to observe the polling and counting processes in Bujumbura, Gitega, Ngozi, Kirundo, Mwaro, Muramvya, Karuzi, Muyinga, Rumonge, Bururi and Makamba Provinces. The EAC has followed the Burundi electoral process since January 2015 through consultative sessions by the EAC Eminent Persons (PEP), Pre-Election Assessment Mission (PEMi), the EAC Council of Ministers and EAC Emergency Summits. Through these initiatives, the EAC, while appreciating the state of affairs, identified challenges facing the electoral process and made appropriate recommendations. The Mission’s findings are also informed by the report of the aforementioned initiatives. This statement contains preliminary findings, recommendations and conclusions made by the Mission based on independent observation, interaction with electoral stakeholders including the CENI, political parties, civil society organizations, security agencies, and the media, among others. As the electoral process is still ongoing, this statement limits itself to the assessment made up to the polling and results counting processes. In due course, the Mission will avail a more detailed final report on the electoral process in Burundi through the EAC policy organs. The political context of the 2015 presidential election has been characterized by the controversy surrounding the incumbent President Pierre Nkurunziza’s candidature for a third term. This was viewed by some actors as a violation of the Arusha Peace and Reconciliation Agreement of 2000 and the Constitution 2005 of Burundi. Other actors maintained that the first term did not count thus, the incumbent qualifies to vie in the 2015 presidential election. The incumbent’s nomination on 25 April 2015 sparked demonstrations in Bujumbura and some parts of the country which turned violent. The confirmation of the incumbent’s candidature by the Constitutional Court resulted in the deterioration of security situation and the prevailing political impasse in the country. There were persistent violent protests and an attempted coup d’état on 13 May 2015 which resulted in scores of deaths and deterioration of the human rights situation in the country. From the foregoing background, there was an influx of refugees estimated to be around 150,000, some of whom were registered voters, to neighboring countries including the Republic of Rwanda, the United Republic of Tanzania, the Republic of Uganda and the Democratic Republic of Congo. Successive dialogues mediated by the Joint International Facilitation Team comprising the EAC, African Union, United Nations and International Conference on the Great Lakes Region (ICGLR) were convened between Government, opposition representatives and other stakeholders in order to resolve the political stalemate. There were three successive EAC Emergency Summits on the situation in Burundi, and subsequent appointment of President Yoweri Museveni of the Republic of Uganda to facilitate a High Level Political Dialogue in a bid to resolve the political stalemate. The Mission noted that the Political Dialogue was postponed on the eve of the election without consensus. The presidential election which was initially scheduled to take place on 26 June 2015 was postponed to 15 July 2015 following a request by the EAC 2nd Emergency Summit and eventually to 21 July 2015. The 3rd EAC Emergency Summit requested for a delay until 30 July 2015 in order to allow for dialogue and consensus building on contentious issues among all the stakeholders. Lack of political consensus on key issues on the electoral process during the High Level Dialogue including the election calendar, insecurity, the candidature of the incumbent president, return of refugees, media freedoms and civil liberties, perpetuated uncertainty and fear. This state of affairs contributed to some opposition candidates withdrawing from the presidential race. The 2015 presidential election is governed by the Constitution 2005 and a set of laws regulations and decrees. The Constitution provides for fundamental rights and freedoms which are important for the participation of citizens in the electoral process. Article 8 of the Constitution provides for election by equal and universal suffrage. The suffrage is also extended to the citizens in diaspora thereby guaranteeing their enfranchisement. Whilst the framework is adequate for the conduct of democratic elections in Burundi, there have been violations of the fundamental civil and political rights that limited citizen participation in the electoral process. For instance, the attempted coup d’état heightened the closure of several private media outlets thereby impacting on the rights to freedom of expression. Similarly, this denied the citizens an alternative source of information that is critical in making an informed choice in the election. The amendment of the Electoral Code 2014, introduced the use of a single ballot paper that replaced the multiple ballot system. The Mission is of the opinion that this reform is a positive measure as it is able to contribute to enhancing the secrecy of the ballot as well as the overall cost of administration of elections but needed to be accompanied by adequate voter education. The Independent National Electoral Commission (CENI) is the election management body in Burundi comprising five commissioners who are appointed by the President subject to approval of the National Assembly. While CENI enjoys constitutional independence, it does not enjoy the confidence of a substantial proportion of stakeholders. The desertion of the Vice President and one Commissioner as well as withdrawal of members of the Catholic Church from the CENI structures in May 2015 impacted on public’s perception on the credibility of CENI. The Constitutional Court has the jurisdiction to arbitrate election disputes for Presidential and legislative elections in Burundi. It is also tasked with announcement of final election results for presidential election. While the Court constitutionally enjoys independence and impartiality, the desertion of the Vice President of the Court impacted on public’s perception on the credibility of the Court. There were a total of 3,849,728 registered voters for the 2015 elections. The first voter registration exercise was conducted between November and December 2014. The CENI made efforts to enfranchise more voters in March 2015 through a partial voter registration upon the request of political parties and also allowed for inspection of the voters’ roll by the parties. The Mission noted that the two-step voter registration process was operationally cumbersome. The registrants were issued with a récépissé (waiting slip) and were later to be issued with a voter’s card. The two-step process affected the distribution of the voter cards as the cards had not been distributed by 26 May 2015, being the initial date of parliamentary and communal elections before the postponement of polls. All political parties and candidates should be allowed to campaign freely as per the law and with due regard to expression of fundamental freedoms of association, assembly and speech in line with the International Covenant on Civil and Political Rights. According to the Electoral Code, the election campaign lasts for 14 days. The campaign environment was generally tense and characterized by fear and uncertainty. The political stalemate surrounding the candidature of the incumbent president, concerns relating to the security of candidates and their supporters and the subsequent postponement of polls impacted the electoral process and implementation of the campaign calendar. Some candidates to the presidential election participated in the political dialogue aimed at resolving the political stalemate, a process that took place during the campaign period. This impacted on the candidates’ ability to solicit for votes and for the voters to make informed decisions on leaders of their choice. This uncertainty was further accentuated by the reported withdrawal of some candidates from the presidential race, a few days before the polls. An already constrained media in a shrinking democratic space was further affected by the attempted coup d état. The media environment during the electoral process was affected by the ongoing political stalemate. During the period of the failed coup d’état, five private media outlets were destroyed on 13 and 14 May 2015, namely, Radio and Television REMA, Radio and Television Renaissance, Radio Isanganiro, Radio Publique Africaine (RPA), and Radio Sans Frontiere Bonesha FM. The limited access to alternative sources of information apart from the State broadcaster, especially during the electioneering period, limited space for pluralistic ideas and impacted upon the playing field among political competitors. This in turn constrained the options for voters to be adequately informed on the electoral process and make informed choices. The Presidential election in Burundi was held against a backdrop of a tense and violent pre-election period. April to June 2015 witnessed some of the most violent incidents, including a failed coup d’état. Arising from the observed pattern of behaviour over the period, and following a risk assessment mapping, it was noted that the Provinces of Cibitoke, Bubanza and Kayanza had experienced unprecedented violence over the three weeks preceding the presidential polls. On the eve of the polls, there were incidents of shooting, grenade attack and subsequent reports of three deaths in Bujumbura which heightened fear among the population. It was also noted that within Bujumbura city, the following areas were restive with unpredictable security environment: Cibitoke, Mutakura, Buterere, Ngagara, Jabe, Nyakabiga, Kanyosha and Musaga. The Mission did not deploy observers in the above captioned regions as a result of the unpredictable security environment. However, there was relative calm in other parts of the country. The conduct of civic and voter education had challenges and was exacerbated by insufficient funding. The withdrawal of funding by development partners impacted on the voter education which led to reprioritization of resources by the Government of Burundi. In this regard, the Mission noted that voter education initiatives were minimal despite CENI having introduced a single ballot paper of which voters needed to be adequately educated. The EAC observers visited a total of 80 polling stations. The polling process was generally calm and peaceful. Whereas most stations opened on time, some opened later than the stipulated time of 6:00am. In some stations, voting had not started as late as 10.00 am. In Bujumbura, anxiety over insecurity and late arrival of election materials impacted on the timely opening of the polls. In most polling stations visited, polling personnel were present and election materials were in adequate quantity. The polling personnel generally managed the polling process in a professional manner. Apart from the CNDD-FDD party agents who were present in all stations visited by the EAC Observers, there was a notable absence of party agents of most opposition political parties despite the obligatory requirement by Electoral Code. Beside the EAC observers, the Mission noted the presence of domestic observers and international observers from the MENUB, ICGLR, as well as embassies of Tanzania, Democratic Republic of Congo and Kenya. Most polling stations closed at 4pm as stipulated in the Electoral Code. The counting process took place immediately after the closure of the polls and registered no incident in all polling stations visited by EAC observers. The EAC observers noted that the voter turnout was generally ranged from low to average in most polling stations visited. Pursue an all-inclusive and honest dialogue in order to find a sustainable solution to the political impasse prevailing in Burundi. vii. Undertake measures to remove restrictions on media freedom and allow private media. – Delink the registration of political parties from the Ministry of Interior. – Undertake voter education in collaboration with relevant stakeholders to enhance public awareness and participation in electoral processes. Continue engagement with all stakeholders to find a sustainable solution to the prevailing political impasse in the country. Sustain engagement with the Government and all national stakeholders in order to address the prevailing political, social and economic challenges in the country. The people of Burundi have enjoyed relative peace since the Arusha Peace and Reconciliation Agreement of 2000, which constitutes the bedrock for building democracy, sustainable peace and development in the country. The Mission notes that the electoral period has been characterised by anxiety and uncertainty. The Mission notes with concern that successive efforts to build consensus through inclusive dialogue among Burundi stakeholders have not been successful. The Mission noted that there was relative peace on the polling day. However, the principle of choice was generally hampered by among others, insecurity ( a general feeling of fear and despondency in some parts of the country), confinement of democratic space, civil liberties including freedom of speech, assembly, media, campaigning and the boycott by opposition parties. The electoral process fell short of the principles and standards for holding free, fair, peaceful, transparent and credible elections as stipulated in various international, continental as well as the EAC Principles of Election Observation and Evaluation. The EAC Observation Mission urges all stakeholders to maintain calm and to re-engage in candid and inclusive dialogue in order to find sustainable solution to the political impasse prevailing in Burundi. The Mission would like to thank and extend its profound gratitude to the people and the Government of Burundi, CENI and MENUB for their cooperation during the mission. You can see usual suspect Didier Reynders from Belgium speaking on the country again. U.S. has to speak and does say it softly. Canada’s foreign affairs also had an opinion on the election. Red Cross is concerned about the refugee situation concerning the violence in Burundi and how it affects the bordering countries and their refugee camps. Kenyan TV report: – This is from today and is a Youtube clip. “The legitimacy of the electoral process in Burundi over the past few months has been tainted by the government’s harassment of opposition and civil society members, closing down of media outlets and political space, and intimidation of voters. Dozens have been killed, and as many as 167,000 Burundians are now refugees in neighboring nations” (…) “Attempts by the Government of Burundi to deny citizens the ability to choose their leadership freely, without intimidation and threat of violence, will force the United States to carefully review all aspects of our partnership not yet suspended, including the imposition of visa restrictions on those responsible for — or complicit in — promoting instability in Burundi through violence” (Kirby, 2015). “Didier Reynders deeply regrets the organisation of presidential elections in Burundi, today 21 July. These elections do not meet the minimal requirements of inclusiveness and transparency. They are not credible and will not contribute to a solution for the crisis in the country” (…) “Belgium calls on Burundi to revive the spirit of consensus and inclusiveness of the Arusha agreement, that is still the cornerstone for constitutional order and stability in Burundi” (Reynders, 2015). MP for Foreign Affairs Rob Nicholson says: ““His bid has unleashed instability and violence characterized by the unrestrained use of force by militias acting with total impunity, exacerbating an already dire humanitarian crisis. Close to 170,000 Burundians—including prominent members of government and key democratic institutions as well as journalists—have fled to neighbouring countries fearing for their lives. Dozens of people have already died in violence related to the political unrest” (…) “Canada calls on President Nkurunziza and his government to protect the rights and interests of all Burundians and work with the East African Community and the African Union in accordance with the Arusha Peace Accords” (Quinney, 2015). “he EAC Election Observer Mission started arriving in the Republic of Burundi on 17th July 2015 and underwent briefing on Election Observation Methodologies and from CENI” (…) “The EAC Election Observer Mission was deployed today, 20th July 2015 to various Provinces of Burundi to observe the polling and counting processes” (…) “The EAC has been involved in the Burundi Electoral process since January 2015 through the Panel of Eminent Persons (PEP), Pre-Election Expert Mission (PEMi), the Council of Ministers, and the Summit of the EAC Heads of State” (EAC, 2015). “In one day alone, more than 30 malnourished Burundian children were admitted and showing secondary complications including malaria, pneumonia, worms, anemia and diarrhea. At least four known deaths of malnourished infants have been recorded so far” (…) “Burundian Presidential elections, set to take placed on Tuesday, July 21st. An estimated 25,000 people have fled to the Tanzanian border camp in the last month alone, bringing the total number of Burundian refugees to around 78,000; a fifth of which are thought to be children under five” (…) “Tensions are running high between new arrivals and the long-established refugee population from eastern Democratic Republic of Congo (DRC), most of whom arrived in 1996 following the Rwandan genocide and the subsequent regional instability” (Carrol, 2015). Hope you found this interesting while the voting and polling is coming. I can’t wait to see what the EAC report on the election says and we all know kind of already what result will be. The numbers is the thing we wonder about. But the winner and third term is happening because like for instans the opposition parties Agathon Rwasa FNL has pulled out and so has other parties done. So you can just see what happens and it sure will be the winner of Presidential Election of 2015. The third term of the CNDD-FDD… so many means is breaking with the Arusha Peace Agreement of 2006. Well, Pierre doesn’t agree and doesn’t care. He is on the Power Kool-Aid and can’t have enough. 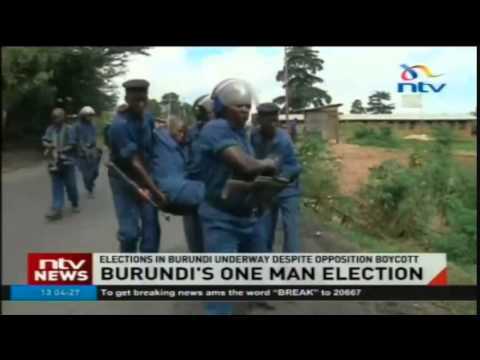 All of the people of Burundi don’t all agree with the President Nkurunziza. Peace.